Facebook has become infamous for its facelifts, as there seems to be one every few months. Many times the cosmetic changes have left the site’s members unimpressed and protesting that they preferred the “Old Facebook”, but often outcries generally seem to die down as people get used to the changes and even begin to like them. Will this be the case with the newly released Facebook brand pages? There doesn’t to be an outright hatred toward them, but many big brands haven’t jumped on the bandwagon as quickly as I had been anticipating they would. The list below outlines three features of the new Facebook brand page that I believe gives it one up on the old one. The overall layout of the new brand pages on Facebook is very similar to that of the relatively new timelines for personal profiles. At the top of the page is a big, rectangular ‘cover photo’, and a smaller ‘profile picture’. The main body of the page is separated into two columns by a dividing line and displays posts chronologically, representing the passage of time. When used correctly, the cover and profile photos allow people to get a good sense of what a brand is about straight away. They can be used to display images connoting to or directly depicting their product or service offering, or a promotion that they’re currently running. They also have huge potential for branding purposes, as the style of images can convey a brand’s image or personality. 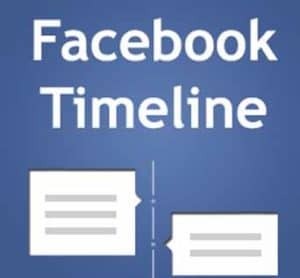 The timeline feature can also be effectively, if brands use it as a record of past events, competitions, launches, store openings, and so forth. Another new feature is that the brand pages allow marketers to “pin” a certain post to the top of their timeline. These particular posts are distinguished by an orange tag on the top right-hand corner of the post, and they stay at the top right of the timeline until the brand decides to replace it with another one. Brands can use the posts they pin to draw their page viewers’ attention to the latest and most interesting content on the page. Posts may be images or words—from new products and behind-the-scenes photographs, to specific call-to-actions and statements regarding the brand’s value or vision. Fans are now able to send direct messages to brands, as opposed to only being able to post on their walls. This is a good thing as brands may avoid getting the negative attention brought about by posts with complaints and angry messages regarding a company’s performance, products, policies, and practices. What’s more, that the brand can send and receive personal messages, is a good thing as the brand will be able to have much more involved interaction in a one-to-one manner, thus deepening and improving its relationships with customers. It will be a while before we’ll be able to gauge how responsive brands are to fans that contact them through personal messages, but Tiffany & Co. has taken advantage of the other features. 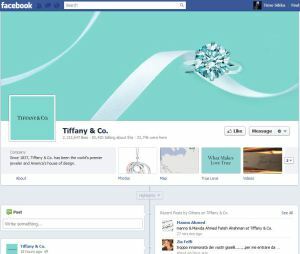 The predominant colour used on Tiffany & Co’s page is the brand’s iconic pale turquoise. The logo is displayed in the profile picture, and the simple image of the company’s main product offering also features in the cover photo. Upon launching its new timeline, Tiffany & Co. also encouraged people to check out their timeline, which described briefly the legendary company’s 175 years of history. Other brands that have taken advantage of the Timeline feature are Red Bull, which added posts to their Timeline, dating as far back as 1988; and Coca-Cola, which added content as far back as 1892! Tetlanyo Lekalake has a strong interest in social media strategy because she knows that social media marketing will be at the forefront of digital strategy in the coming years. Look out for more insight from this inspired writer.